You are driving down the highway late one night at 20m/s when a deer steps onto the road 35 m in front of you. Your reaction time before stepping on the brakes is 0.5s, and the max. 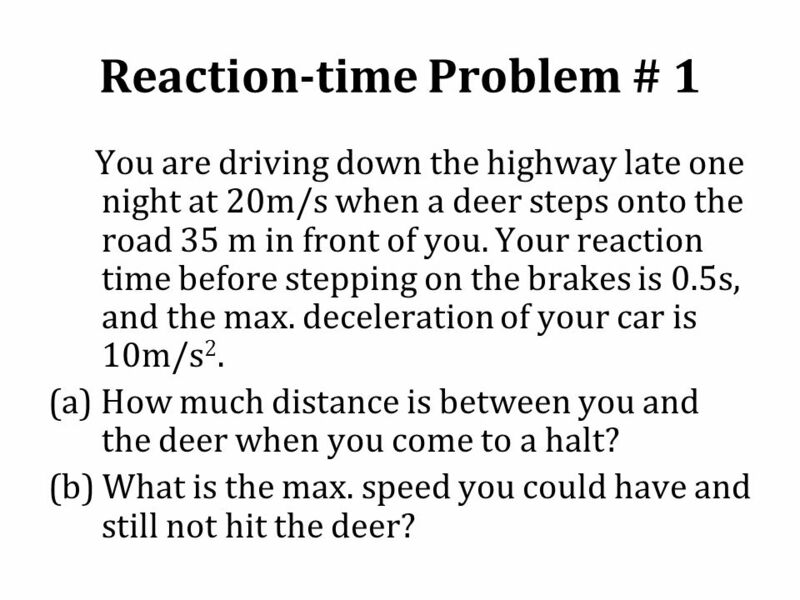 deceleration of your car is 10m/s2. (a) How much distance is between you and the deer when you come to a halt? (b) What is the max. speed you could have and still not hit the deer? The minimum stopping distance for a car traveling at a speed of 30 m/s is 60 m, including the time traveled during the driver’s reaction time of 0.50s. What is the minimum stopping distance for the same car traveling at a speed of 40m/s? 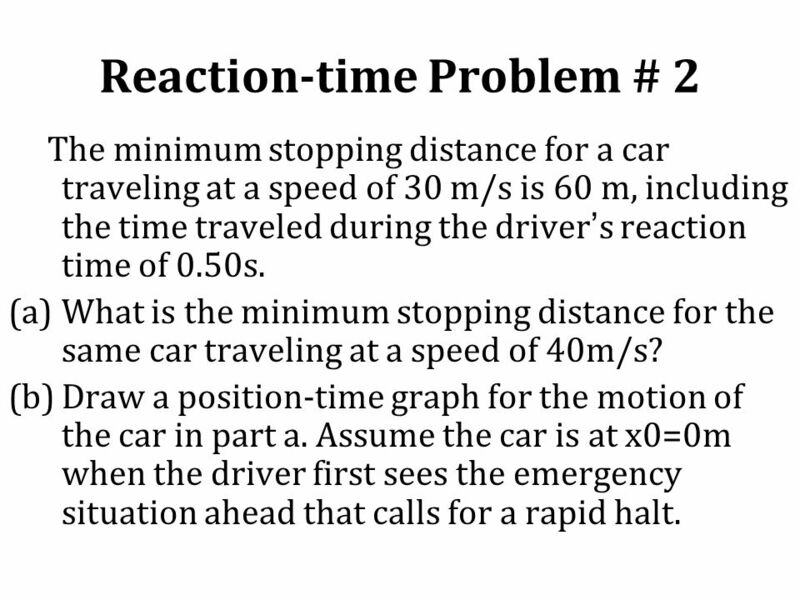 Draw a position-time graph for the motion of the car in part a. Assume the car is at x0=0m when the driver first sees the emergency situation ahead that calls for a rapid halt. 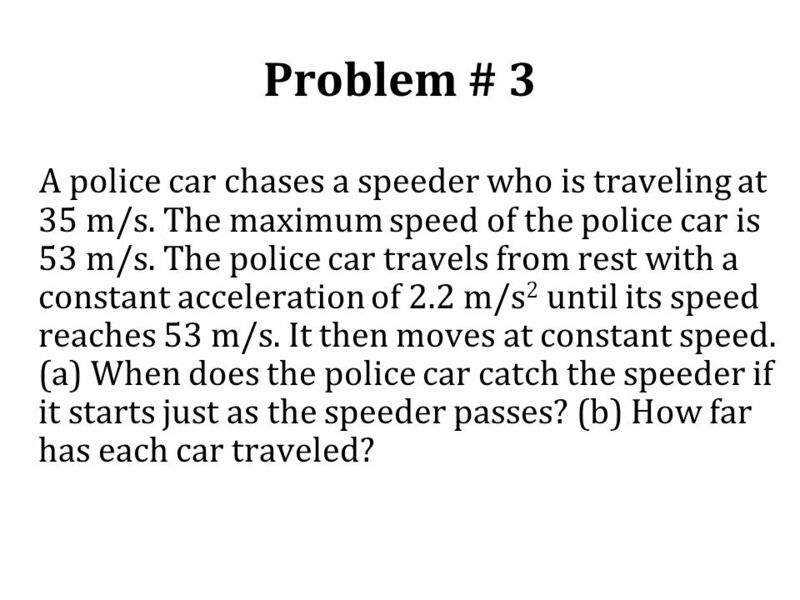 3 Problem # 3 A police car chases a speeder who is traveling at 35 m/s. The maximum speed of the police car is 53 m/s. The police car travels from rest with a constant acceleration of 2.2 m/s2 until its speed reaches 53 m/s. It then moves at constant speed. (a) When does the police car catch the speeder if it starts just as the speeder passes? (b) How far has each car traveled? 4 Problem # 3 contd. When the police car in the previous problem is traveling at 53 m/s and is 100 m behind the speeder, the speeder sees the police car and slams on the brakes, locking the wheel (resulting in a constant acceleration). 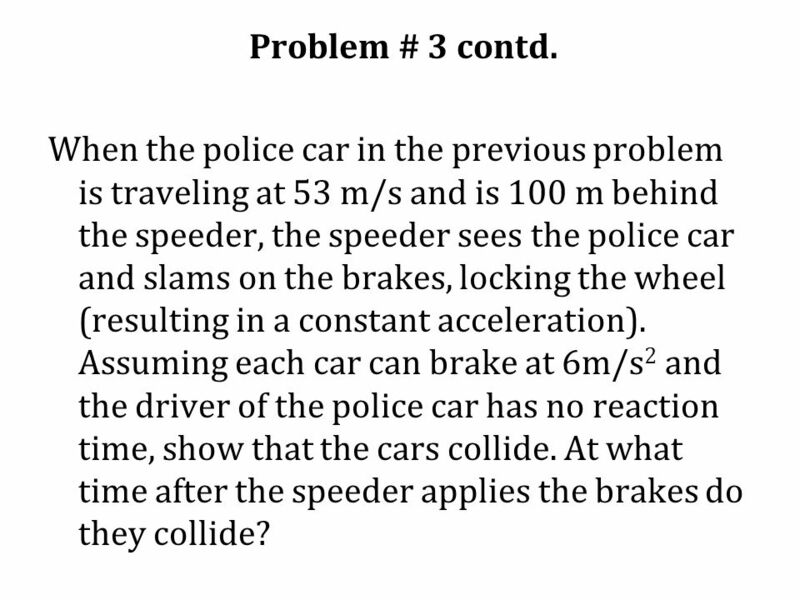 Assuming each car can brake at 6m/s2 and the driver of the police car has no reaction time, show that the cars collide. At what time after the speeder applies the brakes do they collide? Download ppt "Reaction-time Problem # 1"
Motion in One Dimension – PART 2. Kinematics Kinematics is the branch of mechanics that describes the motion of objects without necessarily discussing what causes the motion. We will learn. Acceleration Simplest case a=constant. Equations hold even if Δt large. Δv =vf -vi ti= 0. I have to solve for WHAT? Kinematics Equations. © John Parkinson 1 © John Parkinson 2 Distance travelled - s Time taken - t Velocity - v v= s t v s / t Velocity = Speed in a Specified Direction Constant. You will be given the answer. You must give the correct question. Unit Three Test Review Good Luck!. Sketch a motion map of object A x t A B. Find reaction time Materials: –Ruler or meter stick –Calculator –Scratch paper or notes –Do multiple trials.